Financial inclusion tends to be at the heart of most microfinance institutions’ (MFI) core mission. These days however, keeping true to that mission does not come easy. Besides the extent of their outreach and their ability to offer diverse products, an MFI’s success is now being measured by operational, financial, social, and gender indicators. Leaders must therefore understand that to meet the external demands of investors, boards and clients, they need to create strong teams within the organization that can implement the big strategic visions of the organization. 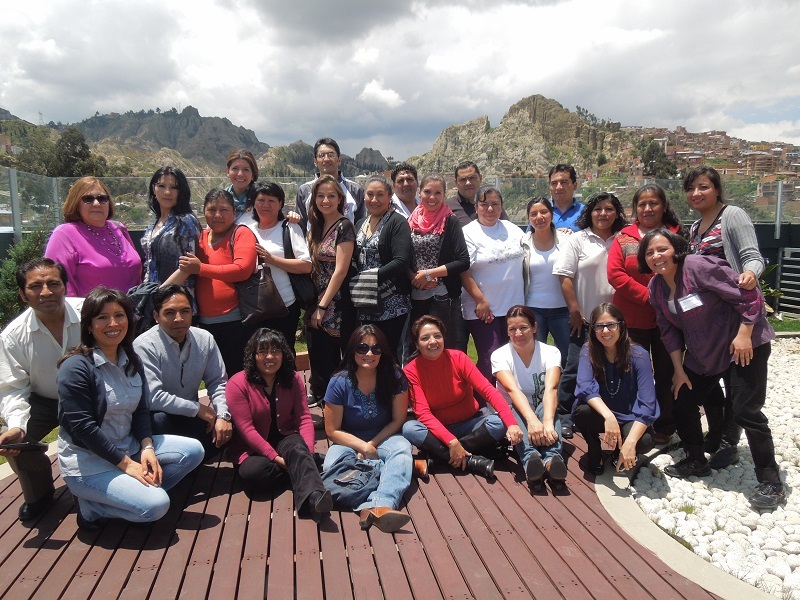 In February 2014, Women’s World Banking’s Leadership and Gender Diversity program team provided Crecer, Crédito con Educación Rural in Bolivia just this opportunity to strengthen its team of managers through the Management Development Training program. develop transformational skills. We use a two-step approach: first focusing on the participants’ understanding of themselves and how they interact with others. The second part is anchored on this self-understanding and introduces tools that build skills in managing people and processes. Most importantly, the course is action-oriented—participants are given the opportunity to immediately test their understanding of concepts as well as try out emerging skills by simulating actions that they might take in given situations. “The course was very practical and has provided us with new ideas to better address the development of our activities, especially in gaining the commitment of our teams to achieve excellence”. The training was as part of the institution’s prize for winning the Inter-American Award for Financial and Entrepreneurial Innovation. Crecer was recognized as an innovative and efficient financial institution that provided financial services to “poor and low-income” populations in Latin America and the Caribbean. Citi Foundation, a long supporter of leadership development in the microfinance sector, sponsored the award which included a customized in-house training to improve their operations. For Jose Auad, General Manager at Crecer, the capacity building program felt very much aligned with the institutional strategy they have in place: recruiting, retaining and developing high potential leaders in the organization while aiming to create greater diversity in the organization. Flying 24 regional, branch, and area managers (over half of whom were women!) to La Paz, Bolivia to attend three days of the Management Development Training was a testament to Crecers’ commitment to staff development. Participants attending the program were selected by Crecer for their individual contributions to the organization as an acknowledgement for their hard work and dedication. For Crecer, the program resonated with the capacity building needs of the institution and helped to ground and align their middle managers with the institutional mission by giving them the tools to develop their teams. Participants told the Women’s World Banking team that the course had challenged and shifted their thinking in terms of maintaining a broader vision for their leadership, their ability to make tough decisions and stepping up to the challenges they face. It also reminded them of the vital role that recognizing and connecting on a human level with their team members plays in being an authentic and effective leader who can inspire and motivate their teams. They were grateful for the opportunity to learn new methodologies and walk away with tools they can use to support, encourage, and motivate their teams to continue performing with professionalism, dedication, and enthusiasm—all the while knowing that their contributions matter. Given Women’s World Banking’s commitment to gender diversity in the workforce, we were pleased that over half of the participants were women. Mr. Auad commented that women are well-represented (demonstrated by their representation in the program) in middle management but that there is a clear decline in number of women at the top tier. He believes that programs on Leadership and Diversity will help create a pipeline of high potential women leaders in the sector. Crecer plans to adopt skill-building modules from the Management Development Program to help develop women leaders in all levels of the organization when they create capacity-building programs forward. They know that this is an investment that will pay off in the long run. We agree. After the program, Mr. Auad told the Women’s World Banking team that the training aligned strongly with the institution’s conscious decision to invest in their number one resource—“their human capital”—to continue excelling in delivering services to the low-income population in Bolivia. Women’s World Banking was honored to work with an institution that recognizes the importance of developing strong, gender-diverse teams in order to serve their clients well and help increase their leadership capacity.